We are looking forward to seeing you at the National Retail Foundation’s show January 17-20, 2016 at the Javitz Center in New York. NRF’s Annual Convention & EXPO earned the nickname “Retail’s BIG Show” years ago and because the name was so appropriate, it stuck. 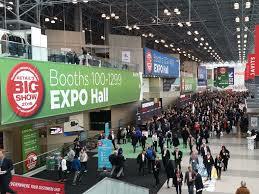 Today, Retail’s BIG Show is NRF’s flagship industry event held annually in New York City. The four day event offers unparalleled education, collegial networking, and an enormous EXPO Hall full of technologies and solutions. After more than a century, Retail’s BIG Show is still the place – the only place – where you can see and experience all things Retail. It is truly one-stop-shopping for industry professionals from the around the world.